As 2-D Cad drafting slips away into history with cassette tapes, 3-D modeling is on track to become the industry norm. Building Information Modeling (BIM) is not new to the industry. Architects and Engineers have been using BIM tools, like Revit, to create 3-D models to pitch clients on their vision for a project since the early 2000s. Today, architects, engineers and contractors use Revit to improve coordination amongst them, thus avoiding conflicts that can result in costly change orders and delays. SKS Studio is committed to integrating evolving technology into our projects, and we are on the forefront of landscape architecture firms that have the capacity to collaborate with architects and engineers who use Revit. Our landscape architects have worked with Revit for a few years and have become proficient in its features and functionality. In fact, our team has used Revit to collaborate with other firms around the world on projects, such as, Kerzner International’s $1.6 billion project, The Royal Atlantis Resort & Residences in Dubai. Since data can be shared to combine all models from different design teams, including architects, structural and civil engineers, etc., to create a master model, Revit is a valuable tool in terms of collaborating on large, complex projects. 3-D clash detection, 4-D scheduling and 5-D cost estimating is performed using the master for pinpoint accuracy. Revit allows the project to be “built” several times in the model and once with precision on the site. Change one element and all others connected to it change dynamically. Firms in charge of different areas can see how their and other firms’ changes affect one another for better collaboration, processes and results. Most importantly, any conflicts are discovered in real time, not during construction, which helps keep large-scale projects on time and on budget. SKS Studio’s philosophy is to include the contractor as early in the design phase as possible. Using a tool like Revit allows contractors to assess the design layout before the build takes place and make alterations accordingly, which results in fewer errors, change orders and rebuilds. Avoiding these costly time delays and resource expenses advances the construction procurement process from design and build to design build. In our experience, working early with the contractor and coordinating through a BIM tool helps everyone involved better understand the project and design goals, plus be proactive about anticipated challenges. 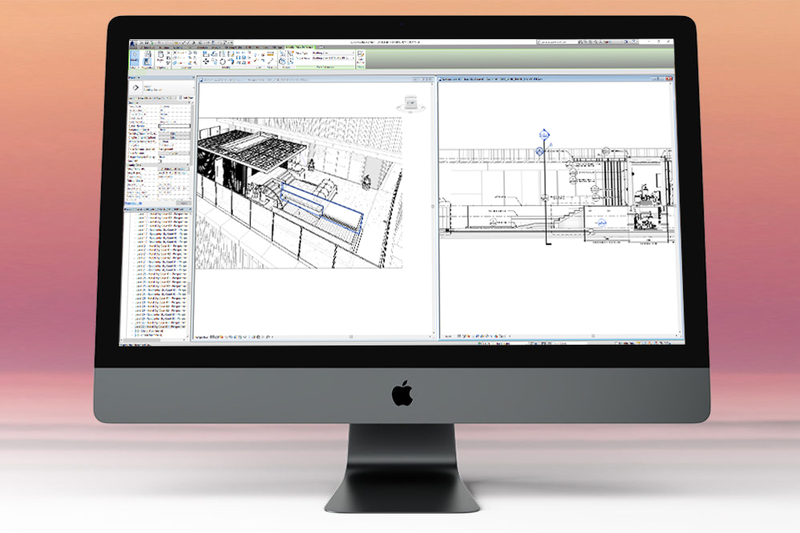 By collaborating with other teams using Revit, our clients achieve better predictability and a level of time and cost savings impossible to achieve using 2-D models. Revit catches errors early on before they become expensive change orders and delays later.